Thiết bị cắt lọc sét SF 3 pha, 800A ,480 Uc bảo vệ cấp II (thứ cấp) ứng dụng cho P-N, 160kA 8/20μs bảo vệ phía đường dây, 40kA 8/20μs bảo vệ phía phụ tải cho mỗi pha. 100kA10/350μs N-E, màn hình hiển thị trạng thái LED,chống quá tải, cảnh báo bằng âm thanh và hình ảnh. 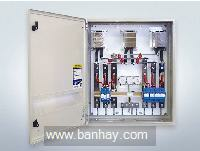 8/207s surge protection (Total of 175kA 8/20μs per phase). Electronic equipment is highly susceptible to damage from lightning and other transient pulses (including man made switching transients), which arrive via the powerlines through direct strike, or inductive, capacitive coupling. Efficient filtering and clamping at the point of entry of power feeds to sensitive electronic equipment is essential to mitigate physical equipment damage, loss of operations and economic loss. The LPI SG+SS480 Series Surge Filter provides multiple stage protection against incoming surges & transientsand shall be installed in series with the incoming mains power supply to the equipment or building.Shunt-only clamping alone is not sufficient, as it does not limit the excessive wavefront characteristic of the pre-clamped waveform. The LPI Surge Filter will reduce the rate of rise of voltage (dv/dt) to below 15V/μs as per AS1768 Cat B 3kA (8/20μs) applied impulse and to below 30V/μs for AS 1768 Cat C 20kA(8/20μs) applied impulse. The SG+SS480 series filter is designed for multistroke lightning events and is supplied with spark gaps as the primary protection between Phase and Neutral rated at 50kA 10/350μs (135kA 8/20μs). The second stage consists of ferro-cored inductors and capacitors (L-C Filtering) which further attenuates the let-through voltage already clamped by the primary stage. Ferro-cored inductors are used as they are much smaller than non-saturating air-cored inductors. Unlike primary MOV protection, the let through voltage of Spark Gaps remain high for only a few microseconds and hence ferro-cored inductors are a practical alternative. The filter attenuates noise and any harmonics present on the power system and is designed to attenuate transverse and common mode noise. The third stage consists of SS480 diverters connected across the load side, these are designed to suppress surges generated by load side equipment. LPI SG+SS480 filter limits the voltage differential due to a lightning induced impulse between phase and neutral as well as from neutral to ground. Thus providing both common mode and differential (transverse) mode protection. Neutral to earth protection rated at 100kA 10/350μs, 150kA 8/20μs, is provided to limit feedback currents if the site earth goes high potential with respect to the sub-station or transformer earth. This is a common occurrence due to a near-by direct strike. Add “C” to the part number for Counter.